Do I need a Budget? How do I get started? What do I put in there? 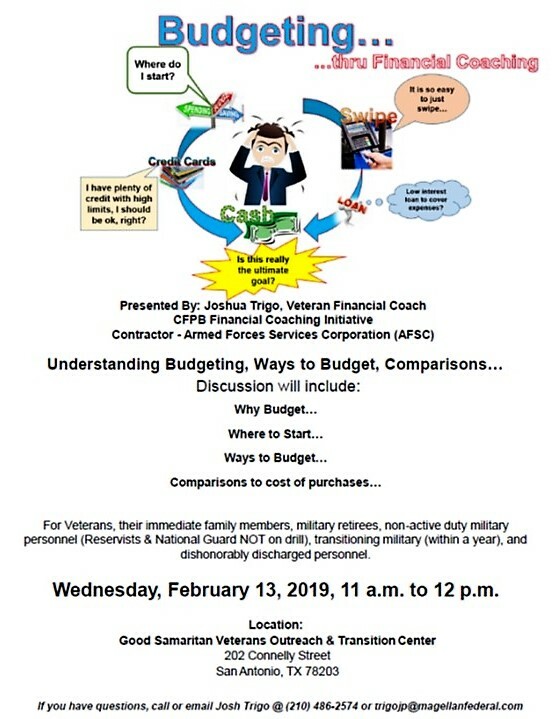 Get the answers to these and other compelling budget questions at the Budgeting thru Financial Counseling Workshop, Wednesday Feb.13 from 11 – Noon at the Good Samaritan Veterans Outreach & Transition Center, 202 Connelly Street in San Antonio. Veterans, family members, transitioning military, reservists and National Guard, and dishonorably discharged personnel may attend. For more information email: jtrigo@afsc.com or call: (210) 486-2574.